Amir's RMAF Day 1 teaser | What's Best Audio and Video Forum. The Best High End Audio Forum on the planet! Could sit there for days listening to this system. Yes, it was playing LPs. 1. Rooms seemed to be pretty damped. Many exhibitors were using side panels to absorb reflections. Add carpet to it and dropped ceiling in the case of Mezzanine floor, and you had the made up of fair dead rooms. I think this took away from performance of some of these systems for someone like me who likes to hear a more live room for music enjoyment. 2. Overall, the presentations were superior to CES. Larger rooms with much better configuration than the ones in Venetian hotel at CES. 3. This is the really sad part... Seems like audiophiles as a group are not fond of taking showers!!! I kid you not. You had to hold your breath in the elevator and common areas. What's up with this guys? We need to leave a better impression with local folks . The place smelled so much better around 8:00pm or so when I left. 4. I listened to a live Piano recital for few minutes and it sounded wonderful. Michael heard another earlier in the day. Did not expect that, nor sadly had the time in my schedule to do more of it. 5. I find Denver people very friendly. Was driving in remote areas in dirt road on top of mountain passes and locals going by would still take their hands of steering wheel to wave! 6. Had a flat in my rental car yesterday morning. Called Dollar Rental car and she asks me, "sir, would you like to buy a new tire from us or do you want us to charge you to send someone to replace it with the spare?" What the heck? I am accountable for flats now? "Oh sir, you waved that protection." SOB. Had to drive to one place to put air in it, and go to Discount Tire to get it patched. It was a nail and they fixed it for free. 8. Bummed that there is not much opportunity to have one's own music play. Brought my own flash drive but other than Phillip's booth (funny story on that later), I could not get anyone else to play it. 9. Ran into an old friend/colleague, Chris Walker who worked for Pioneer for years. He had left to join the German company (ELEC?) with Andrew Jones and once again pulled a miracle by creating very good sounding loudspeakers for what we will pay for dinner tonight! 10. 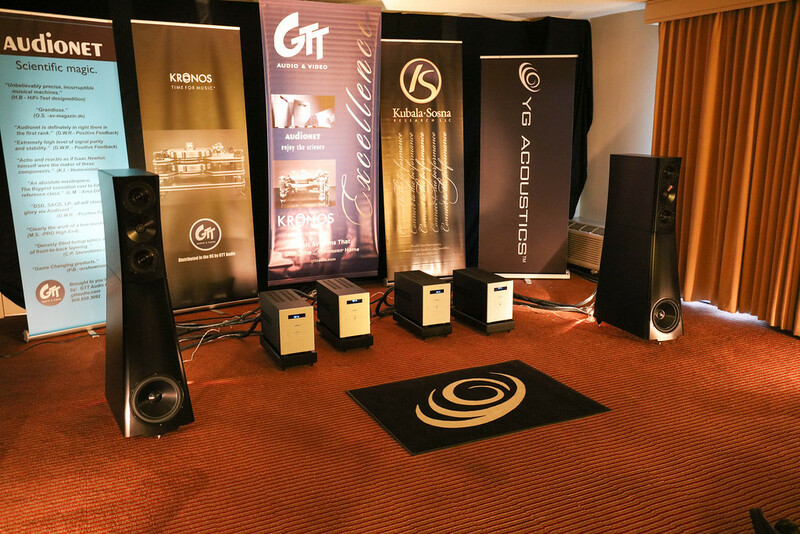 As I noted elsewhere, I was very disappointed with the demo of Kii loudspeakers. If anyones to beat me up with "DSP and measurements don't translate to good sound," this is your opportunity. By every metric I use to listen to a loudspeaker, it did poorly. Don't know what was going on. And oh, this was another room which refused to play my sample tracks despite playing everything on their computer. Anyway, don't want to be late again today. Don't say anything bad about me while I am away from the computer. A fine German manufacturer, established in 1926 (!). Thanks for the early report Amir. Got a laugh out of point 3, not found of showers. Thanks for the detailed teaser!!!! Great read. BTW, Audionet makes a superb control app for iOS. Now that I've taken a shower and put on some deodorant I was wondering if you could do me a favour Amir? I love all of the pics people take and post, and some of the gear is most drool-worthy. It is however way beyond my ability of ever owning, so could you take some pics of less expensive gear that impressed you or that you saw? Amir, thank you for finally pointing out one of my pet peeves at an audio show. Your point #3 is even more of a 'distraction' at shows like Newport, where the weather is a little 'warmer'! Come on guys, if you can afford $$$ for gear, a few cents for deodorant and a shower???Yeez! If you have a chance, check out the Resonessence Labs room. They are debuting their new Veritas DAC. I was going to supply the speakers for the show, but I would of had to build a custom passive system. Since my focus is active now, I backed out. Heard they decided on some small Maggie's instead. I don't know if eclipse has speakers there, but they are supposed to be pretty good, model TD712zMk2. It would only matter if 15A is not enough to drive their built in amps properly. If anything was wrong I seriously doubt that THAT is the reason. It would have to have been extremely poorly designed and honestly, given Bruno's track record, I certainly doubt that of all things he'd screw up on he switch mode power supplies. I just came back from 7 hours of roaming the halls at RMAF. And I spent a fair amount of time listening to the Kii Audio room. I had heard Kii Three's in Munich but since that was a pre production model I wanted to hear the finished version. The Kii's were driven only by a MacBook Pro connected via an internet cable, with no intervening electronics. The room itself had zero acoustic treatment, horrible acoustics, you could hear how "hard" the room sounded when there was no music, just people talking. Well the sound from the Kii's just filled the room, there was a very spacious soundstage that projected well in front of the speakers. Dynamics were excellent and frequency response was impressive, particularly in the bass area. I sensed no distortion which really surprised me given how bad the room acoustics were. Obviously the technology Bruno has designed into this all in one DAC-amplifier-speaker is something very special. Needless to say I was very impressed. I can't wait to hear them in a good room. They played my test tracks for me. I think they are limiting the music selection, not a bad idea given the issues with room acoustics. Amir - I read somewhere else that no CD players (almost) were around, your take on this? Not true. I recall at least half a dozen to a dozen CD players used as sources. One example was in PS Audio room where I remember someone bringing their own CD which they played. Indeed I wished I had brought a CD with me in addition/instead of a flash drive. I just couldn't figure out how to fit it in my pants pocket . dCS had a new DAC with optional optical drive. That said, they clearly, clearly have fallen out of favor. By far LPs were the #1 format. Playback from a Macbook/server was second. CD after that and as I noted, tape was not used anywhere.